Getting a job in the fashion industry is a very involved and challenging process that pits you against countless other fashion experts. If you want to stand out in the job market, you need a digital portfolio. A digital portfolio is just like a traditional portfolio filled with your fashion flat sketches, except it’s available to view on any online-capable device. Fashion Classroom in New York City is all about prepping you for your dream fashion job, and that’s why they want to help you craft an exceptional portfolio. 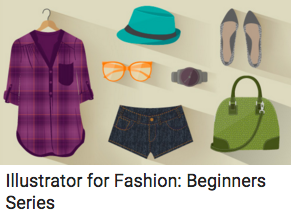 Create Your Images: Whether you’re scanning hand-drawn images to edit in Adobe for fashion industry jobs or you’re creating your designs in Photoshop, Fashion Classroom can help you learn how to create fashion drawings that stand out from the crowd. They provide in-depth access to every type of fashion software there is, so you can craft stunning images that wow potential employers. Edit Your Images: After you create your initial image, editing the image to fit into the portfolio is key. You don’t want a simple sketch. Your image should be completed using an image-editing program—and to make sure you get the best results that really show off your talent, Fashion Classroom offers Adobe Illustrator classes. It’s important to erase dust spots, play with the colors, draw new lines, add text, crop, and collage your images together. Posting Your Digital Portfolio Online: There are many websites that you can use to host your digital portfolio. A few that Fashion Classroom recommends are Carbonmade, Coroflot, and Styleportfolios. Each of these websites offers the ability to scan your sketches, save them as JPEG files, and upload them onto the site. They offer easy online tutorials, and are free to use. There’s no better way to take everything you’ve learned from Fashion Classroom and use it to impress employers. Before you apply for one of the incredible jobs available on the Fashion Classroom website, make sure you have your digital portfolio ready to go. If you need help getting your images ready, Fashion Classroom offers multiple online fashion classes that cover every type of image-editing software you could need. Call (201) 674-2683 today for more information.